Strawberries are a good source of vitamins C and K.
If you're interested in what vitamins are in strawberries, you may be surprised to learn that these succulent large berries are a good source of vitamin C. Not only that, but they provide a good option for a sweet good-for-you treat that isn't high in calories. It's common knowledge that fruits are good for you, but when you step back and take a look at strawberries, you'll find that along with the vitamin C, strawberries are a healthy source of phytonutrients and antioxidants. These nutrients are known to fight free radicals which are responsible for cell damage that contributes to cancer. How you handle strawberries can make a difference in the nutrition you'll get from them. Whether you pick your own strawberries or buy them at the store, it is best to eat the berries as soon as possible. Cooking strawberries will diminish the amount of vitamin C available because heat kills vitamin C. With that in mind, it is best to avoid leaving strawberries out at room temperature for more than a few hours. 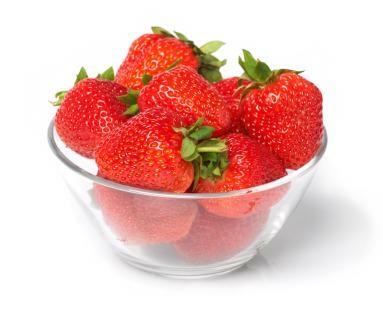 If you purchase strawberries at your local grocery, choose berries that are bright red in color with fresh green tops. Take a moment to inspect the package carefully for any signs of mold. While it may be tempting to purchase a package of strawberries on clearance that has started to spoil, it's important to know that if one strawberry has mold on it-mold spores have spread throughout the package. Another step in maintaining maximum nutrition is not to remove the strawberry's cap until you are ready to eat it. When the cap is removed, cells in the berry release the enzyme ascorbic acid oxidase which destroys the vitamin C.
For optimum nutrition, when storing strawberries don't keep them in the refrigerator for more than 2-3 days. Store them unwashed and loosely covered. When you're ready to use them, wash them in a strainer under cold water, but don't soak them. Letting them sit in water can actually cause them to lose flavor. Along with these vitamins and a variety of minerals, one cup of strawberries also delivers .96 grams of protein. You get all this nutrition and taste for just 46 calories. Can Dry Skin Be Caused by Vitamin Deficiencies? By Erin Coleman, R.D., L.D.